Donald Trump is expected to sign an anti-trust investigation order into Silicone Valley Big Tech’s Monopoly. Too many conservatives and Trump supporters “opinions” are being squashed like a bug. With big bully brother Google the mack-daddy of them all. 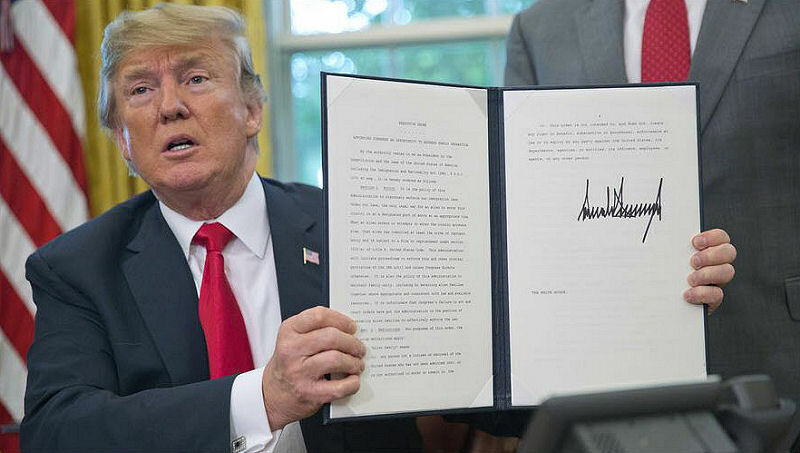 President Donald J. Trump is expected to sign this executive anti-trust investigation order into big tech bias and censorship. It’s overly obvious and goes without saying “we’re not interested in your political opinion” despite this blogs excellent seo and article readability scores. I’ve been personally impacted by big tech bias in social media. As a computer bulletin board system operator (Sysop.) I’ve been bouncing early electronic mail worldwide via the Fidonet network using 2400 baud modems long before the Internet was made available to the general public. Doc’s Place Fidonet BBS is still online today 27 years later. The dial up lines were ditched in 1997 and it was upgraded to allow callers via telnet and the web. So I’ve been around the block a time or two. The Internet was a blessing when it first came out. As a hobbyist I’ve kept up with tech since those early days and followed Google like a hawk. Personally I feel big tech as a whole was allowed too amass too much power over the people. Bloggers like me are being punished for supporting our president Donald J. Trump. Facebook literally slapped me silly for a comment saying “Obama the monkey should be in a #Gitmo cage.” Zuck gave me a 24 hour posting ban. He said it was hate speech. Hey I’m sorry but Barack Obama does look like a monkey. 😆 It’s censorship plain and simple! As for big brother Google they do hold the keys to the internet. Google decides what you will find when their index is searched. I’m also a victim of their leftist censorship. This blog is chock full of support for Donald J. Trump. I’ve been blogging in support of Mr. Trump since his presidential campaigns early days. A few months ago i went through my blogs keywords and keyphrases in my Google search console. The keyword Trump appeared TWICE out of 900+ equerries. Google was censoring the keyword or keyphrases containing the word Trump. It’s time for an anti-trust invest. There is also a huge double standard being plaid out on Google owned YouTube. Conservative and trump supporters videos are being flagged and removed by Southern Poverty Law Center. They are the liberal scumbags who define hate speech for YouTube. Ethan Klien’s live stream account was suspended for talking about suspended Alex Jones. Google is suspected of spying on us with our Android phones. The list goes on and on! My FidoSysop YouTube channel is not being seen. I have narrated screen videos produced during Donald Trump’s campaign that must be invisible. Videos with 10 views, 20 views, etc. Shame on you Google! 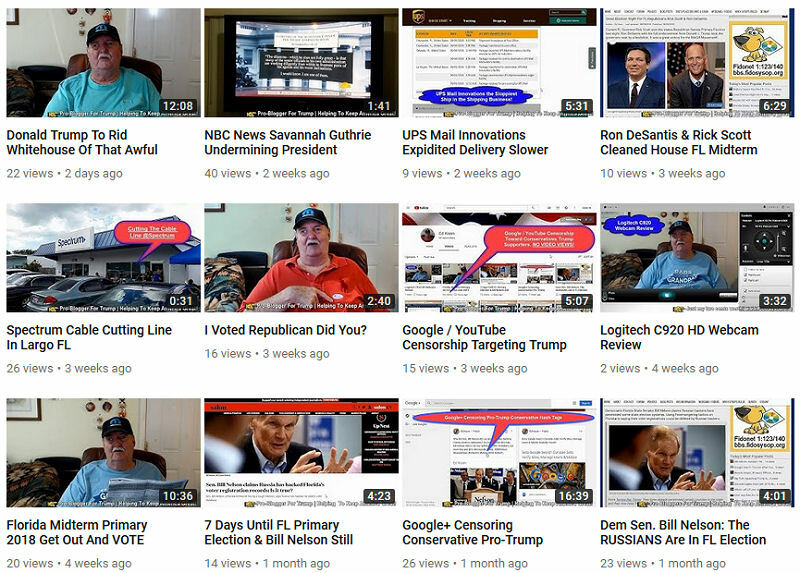 Screen shot of my FidoSysop YouTube channel videos wit hardly any views. Under the circumstances with big tech censoring conservatives and Donald J. Trump supporters an anti-trust investigation is warranted. Anti-trust regulators broke apart AT&T who was slamming peoples long distance providers and stifling competition. AT&T thought they were more powerful than the government. They deserved what they got! Update 09/26/18: There is speculation depending on where it’s posted, the investigation order draft may not be correct. Under the circumstance I’ve removed FidoSysop’s copy. One source said the anti-trust document draft has been circulating around the Whitehouse for some time, and was leaked to Bloomberg. As of this post update It’s uncertain if President Trump will order the investigation. I will post another update when further details are announced. But one thing is for certain, traffic in a Facebook Trump group I frequent suddenly stopped. It was like someone flipped the switch off. Lots of conversations regarding allegations of sexual abuse by Professor Christine Ford toward Brett Cavanaugh that just ground to a sudden halt. Twitter posts and comments are similar. Sure seems like manipulation to me. Can’t say they (Facebook, Twitter, and Google) didn’t have it coming. To trample all over our constitutional first amendment right to free speech was a mistake. When this anti-trust order is signed by president Trump watch their stock fall like a rock. They were warned!